Unknown to many users, there’s a virtual activity that takes place on the internet daily. The nature of the trading is not the easiest to understand, but a small percentage of people have mastered and even make a good living out of it. In order to buy and sell domains for profit, you need to be aware of how the whole process works before putting all your feet into it. Flipping domain, another term that is commonly used, is the process of buying domains at low prices and selling them for higher prices. The main reason for buying these domains is because they have commercial values for businesses to propagate in the online space. On the other hand, the reason for selling could vary. Maybe a company/organization is no longer operating or maybe the domain isn’t being used for a very long time. Either way, an entrepreneur would see this as a trading opportunity. That’s why there are people who go around collecting attractive domain names and then resell them at astonishing prices. Many sell for hundreds, some for thousands and rarely, for five figures. Buying domains (from registrars) are easy, but selling them is clearly not as straightforward AND as lucrative as you hope. A lot of factors weigh into the pricing structure, on top of which, you also need to know how to attract the right buyer and when to sell. The first thing to understand here is that domain prices are perceived differently by different people. What you think as profitable, may not be the case in the actual market and what appears as ordinary names, could potentially sell for a lot of profit. Unearthing the real values of domains is not always easy, but we can make a few educated guesses based on what has worked so far. 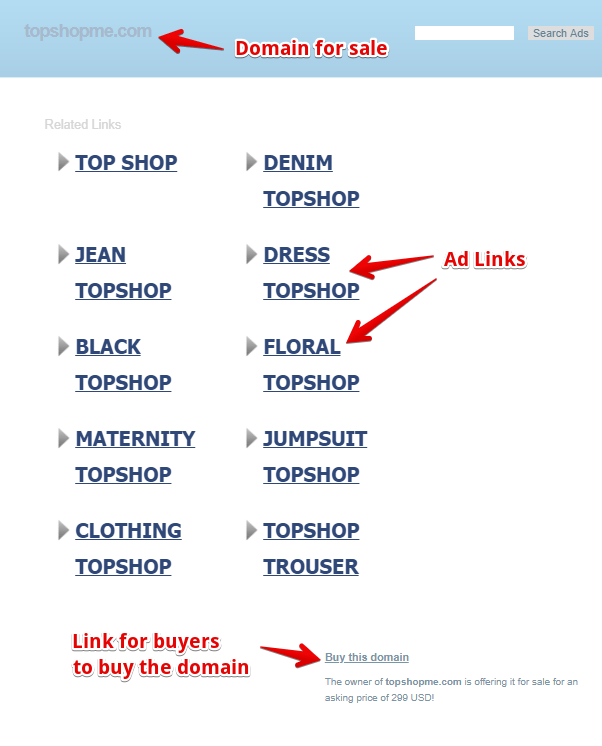 Selection of words – Domains after all, are a string of words and what you put into it matters. Generic, brandable and even alphanumeric words can be used, but they have to be relevant to niches that you’ve researched or familiar about. Those that sell fast are usually words that trigger interest. Length and number – The shorter the words in the least amount generally cost more because they are easy to spell and remember. However, this opportunity can be rare nowadays, as the one or two-word combination are pretty much taken up and convincing the owners to sell them can be quite difficult. Find out more about how you can use Jaaxy keyword tool to easily brainstorm for new domain names. Age of the domain – Naturally, the older the domains, the more valuable they are. If they run with well maintained websites, they are likely to rank better on the search engines and hence, more sought after by the buyers. Domain extension – Anything within the top level domains can potentially fetch better prices than newer domain extensions. However, the .com, has proven to be the most favorable as it carries more commercial values. Therefore, if you are able to get the formula right, you are this much closer to offering a valuable domain instead of just simply buying one that is fancy looking. This will allow you to gauge the selling price based on its worth and put you in a better position to negotiate with potential buyers. Fixed price, whereby the selling price is already made final by the seller. Also known as premium domains, they sell faster because the process doesn’t involve any haggling. Offers price is the price proposed by the buyers to the sellers. The selling price is what both parties agree after the negotiation. Auction price is when sellers wait for buyers to make offers during a period of time and then sell the domain to the highest bidder. Finding a valuable name is just one part of the battle won. The next step is to figure out how to sell these domains. Each method has its pros and cons so make sure you know the ins and outs before embarking onto the process. Parking is a term used for placing a domain temporarily on a landing page without associating to any website hosting and many registrars provide this service. Some buyers search for domains through the search engines and this could lead them to the landing pages if you’ve set them up. That way, people will know if it is for sale or not. In addition, the page can be used to display advertisements, so that when it is clicked by users, ad revenues are generated. 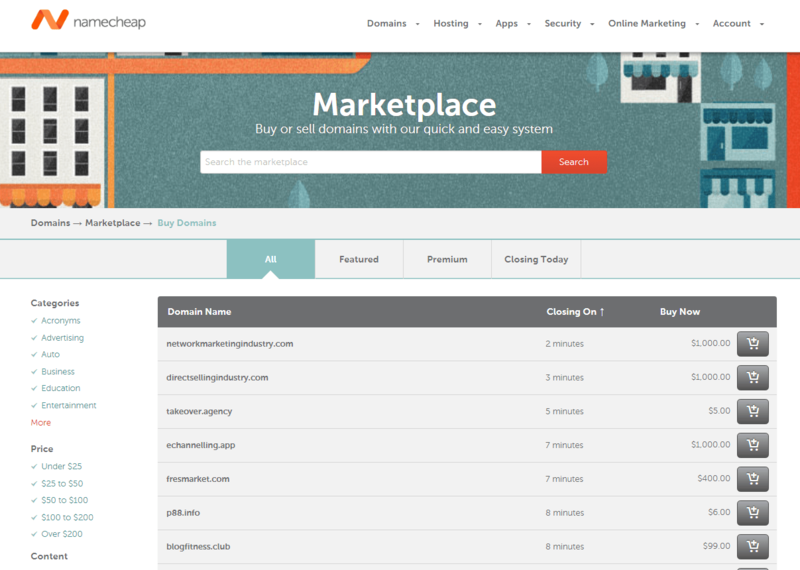 Domain registrars like Namecheap and GoDaddy offer an easy way to park domains for free in return for a commission when a sale is made. The advantage of using marketplaces is to get more exposure. Often times, they also provide many in-house tools that can quickly set up the landing pages, get the domains listed for public viewing and secure payment (escrow) for transactions. However, like most marketplaces especially in the domain industry, you are entering a very competitive trading territory. Many people will sell for as high as they could, while buyers will seek for the best bargains. Here’s a list of marketplaces to explore, most of which are free to use, but will charge varying commissions depending on how the domains are sold. If you subscribed to hosting packages that provide generous amounts OR unlimited website hosting, then you can actually park those domains on personal webpages. This gives you full control of the content and maximize ad revenues if you choose to use them. It does require a bit of work like setting up the webpage and tweaking some SEO features, but the cost of hosting is measly if you maximize the usage of the account. Find out how you can host up to 25 domains on this powerful WordPress hosting. As mentioned earlier, one way to really boost the value of a domain is to create a website around it. It’s similar to building a property on a land and resell it at a higher price. In this case, you will sell the domain AND the website portfolio along with it. The only set back is that website building is time consuming and requires a lot of SEO work in order to achieve good rankings that affect the domain values. It’s definitely something that you want to take on as a team, instead of doing it alone. If you prefer not to deal with all the troubles of listing and negotiating, engage a broker service to do the work for you. Let the professionals handle the necessary procedure and find the right buyer tailored to your expectations. Just remember that you need to pay contract and commission fees upon successful deals. Now that you get the big picture of what domain flipping is about, here’s a few more questions to ask yourself before investing in a domain. What’s your budget like? If you want to go out there and trade, you’ll need more than one domain so your assets could range between 10 to 100 of domains plus the annual renewal fees. Keep in mind that it will take time to sell them – some wait for months, some years and in worst case scenarios, some will never attract potential buyers. That’s cold hard fact number one. Are you familiar with niche markets and keyword research? If you don’t know what they are, then it’s time to open the books (or Google) and start learning about trends and industry behaviors that are happening around us every single day. Analyze what could change in consumerism in the months and years to come, locally and globally. Talk to experts if you must, to get better insights. All this information can point you to profitable niches and most importantly, the right domain names to use. Do a thorough research on the best practice to approach this form of online trading without overspending. Keep and open mind, but beware of self-proclaimed gurus and defaulters too. It sure is, but it’s a learned skill, one that will require time, money and maybe a few costly mistakes along the way. The market is there and as long as the internet continues to expand for commercial purposes, there’s always opportunities to buy and sell domains for profit. The success story that you read about someone selling a domain for thousands of dollars is all based on years of hard work. It’s not magic, but that doesn’t mean it’s impossible for you. Who knows what can be achieved with that talent of yours, right? If you are still interested in this business model, you can test the water with a few domains and see how it goes. Here’s a good training platform to assist you in domain selection, understanding niches as well as keyword research. Give it a go and feel free to get in touch with me for more information. Question – What’s your experience or opinions about flipping domains? Let us know in the comment section below. I often wondered about this industry as I have a few parked domains and don’t know what to do with them. Due to the time and money investment, I know that it is going to be a costly learning experience. I wasn’t ready to risk an expensive mistake. Honestly, you floored me when you said there are brokers. Clearly, this is a competitive business that I know very little about. Thanks for sharing the monetizing details. I may just look around and see what it is all about. Like yourself, I have been trying to make a career change and I was leaning towards an online business of some sort. I came across your website while doing some research on the subject. I am not sure if I would want to attempt the domain buying and selling route yet. At least not without some experience under my belt. After being introduced to the Wealthy Affiliate training platform, I believe that I may have just found my answer to my new career choice. In my research for starting up an online business, I came across a couple of websites that offered this same type of opportunity, but their prices were ridiculously high. I wasn’t interested if it was going to cost me thousands of dollars with no real guarantee of seeing the return on it. I just don’t have that kind of money. WA, on the other hand, charges reasonably and the budget was doable for me. I also really love the fact that I get training for free while I test drive the idea for a week. This is totally a new area for me so I would want to have the time to consider before committing to it. I have a few questions though. Are there any other fees that I may have to pay? How long does it take to get things rolling to the point that I will start being able to think about giving up my day job? Thanks. Seeing that you are a total beginner, there’s nothing else to add on the fees besides paying for your domain which is about $15 per site annually. The keyword tool that comes with your membership, albeit basic, is more than enough to get your content rolling. After a couple of months of learning the ropes of affiliate marketing, you may want to invest in an auto-responder, but that’s certainly later down the road. How long it takes to see results pretty much depends on your commitment to building the site on a daily basis. I spend at least 4 to 5 hours a day, everyday and make a lot of lifestyle changes because of that. I don’t recommend that you give up your day job just yet. Creating a passive income online isn’t magic and it could take a fairly long sprint from where you are now to what you really want to achieve. Keep your job and work a schedule around it, building your online business bit by bit everyday. Stick to your goals and the training within WA and you’ll be heading the right direction. 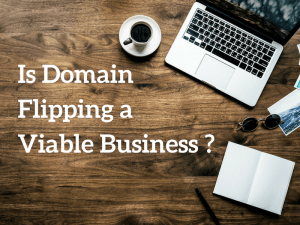 Thank you for this informative article about domain flipping. Honestly, I didn’t know it was a thing, and the only thing I had heard of before was flipping websites. I imagine though it’s kind of a big learning curve, but if you get good at it, you can make a good income online. I can only imagine how much hotel dot com and travel dot com would probably go for. I really would like to try this in the future when I have more time and money. Thanks again for letting me know about this lucrative money making opportunity. There could be great money in doing this if you want to out in a little work to get the domain working well in the search engines. I have two examples of people making money from flipping domain names or websites. About 8 years ago, my partner and I sold one of our domains for 500 bucks and I personally know someone who just recently sold one of his domains for almost 30 000 bucks! Am glad I came across your article. I have heard of trading in domains but never knew how people made money. I always say knowledge is power and you learn something new everyday. From the video, the guy has really left ‘my jaw on the floor’. It’s like dealing with real estate or the stock exchange – the profits being made are mind blowing. However, he talks about gaining knowledge, skills and practice. Hope to use your information as a guide and take baby steps in learning more about domain flipping. Thanks for the insights. I have for a while been thinking about if buying and selling domains was still a way to make money. I know people in the past have made good money with it, but was not sure if it would still work. In the European country where I come from, it is very difficult to make money like this. If you buy a domain and do not use it, you can risk ending up just having to give it up. If someone has a company with that name and want it – it is the law and you cannot get more out of it than what you paid. So, over here, it is not a good way to make money unlike the international level. Hi there Mikael. I didn’t know that there’s a restriction with domain flipping in the European region. Can you point us to a resource that says so? It would be interesting to find out more. Thanks. Excellent write up. I have spent several months doing domain flipping and I must say, there’s money to be made. But, you need to have a good eye and ready to risk the investment. Also, some patience will improve your chances of success.